Mahmoud Sawafta, the head of the Palestinian Prisoners’ Society (PPS) in Tubas, in the northeastern part of the occupied West Bank, said that dozens of former political prisoners have started, Wednesday, a solidarity hungers strike with Palestinian detainees, who are holding an open-ended hunger strike, demanding legitimate rights. 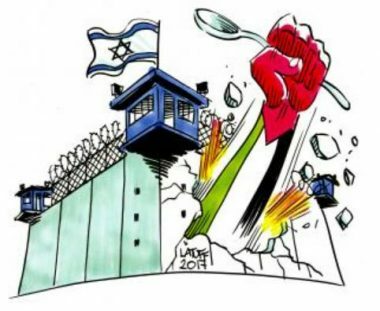 The former detainees said their strike expresses their support and solidarity with the political prisoners, held in Israeli prisons, facing ongoing violations, and denied basic rights, including the right to receive proper medical care. The announcement is part of a series of solidarity activities in Tubas, as well as the rest of the occupied territories. Tubas started its activities 10 days ago, with many processions and solidarity activities with the detainees, including a protest tent. Also on Wednesday, dozens of schoolgirls, mothers of political detainees, former political prisoners and Palestinian Security officers, have participated in these activities, while scout troops also marched in the city, amidst prayers from mosques, and churches. Approximately 1800 detainees have started the hunger strike ten days ago, while dozens intend to join gradually.